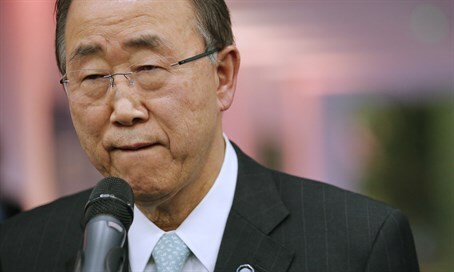 United Nations Secretary-General Ban Ki-Moon admitted that the UN is biased against Israel, UN Watch exposed Wednesday night, in never-before-seen footage of a 2013 session with students participating in Rishon Lezion College of Management’s Model UN program. "There is some bias against Israel, [the] Israeli people, and government," Ban stated. "Israel is a member of the United Nations," he qualified. "Thus, Israel must be respected equally with all other 192 member states. Israel is 193." Then, however, he seemed to backtrack. "Israel should have for all equal rights [sic], equal representation - that is a firm principle of the UN." Despite this, he assured students that he had allegedly encouraged all UN member states to stop discriminating against Israel.